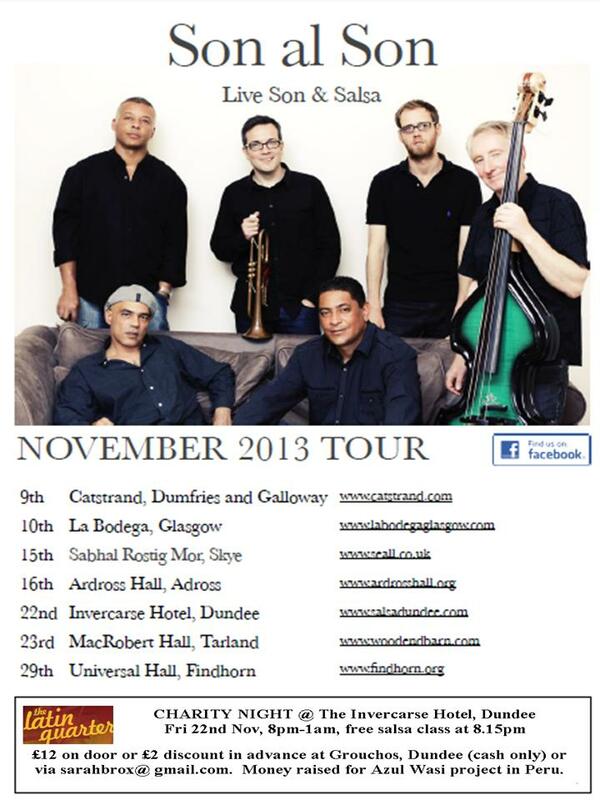 Glasgow – Havana in the Fall- Live Cuban Band, Havana D’ Primera – Friday Oct 16th. THERE ARE JUST UNDER 200 FULL PASSES LEFT, LAST YEAR WE HAD TO TURN PEOPLE AWAY. Son al Son, excellent son/ salsa band playing next thursday at Crail Community Hall, £12.50, 8pm, there is room for dancing & you can get tickets on the door too. http://www.crailfestival.com/programme.html online box office http://www.crailfestival.com/store/p19/Salsa_comes_to_Crail_-_24%2F7%2F14_-_8.00pm.html. hope you can make it ! Also playing in Glasgow on Sun 27th at Stereo, maybe some advance tickets left from band £10 each, leave a comment or in-box us on facebook site, otherwise book on-line via:http://www.ticketweb.co.uk/event/son-al-son-live-band-and-academia-de-salsa-djs-tickets/128475. Only 10 days to go ! Come & enjoy some latin spirit with the groovy live SON al SON band @ The Invercarse Hotel, 371 Perth Rd, Dundee, DD2 1PG on Fri 22nd Nov. 8pm-1am. There’s a free Salsa beginners class at 8.15pm to get any newcomers started. The band are FANTASTIC, a rare opportunity to have space to dance to a live salsa band on a huge wooden floor. Tickets £10 in advance ( or £12 on the door). In advance from sarah at classes or via sarahbrox@gmail.com also from Grouchos in Dundee (cash only). Will be a raffle on the night. Tables can be reserved via sarahbrox@gmail.com for 10 to 12 people for prepaid ticket holders. Money raised for the Azul Wasi project in Peru near Cusco, home for former street children. www.salsadundee.com. Please pass the word ! The band Son al Son was formed in 2008. Its line-up is made up of musicians from Cuba, Ricardo Fernandes Pompa,(Lead Vocals and Congas), Eric Alfonso (Timbales) from Venezuela, Lino Rocha (lead vocals and hand percussion) from Scotland, Bob Thomson (Bass), Simon Gall (Piano and Vocals) and Lorne Cowieson (Trumpet). 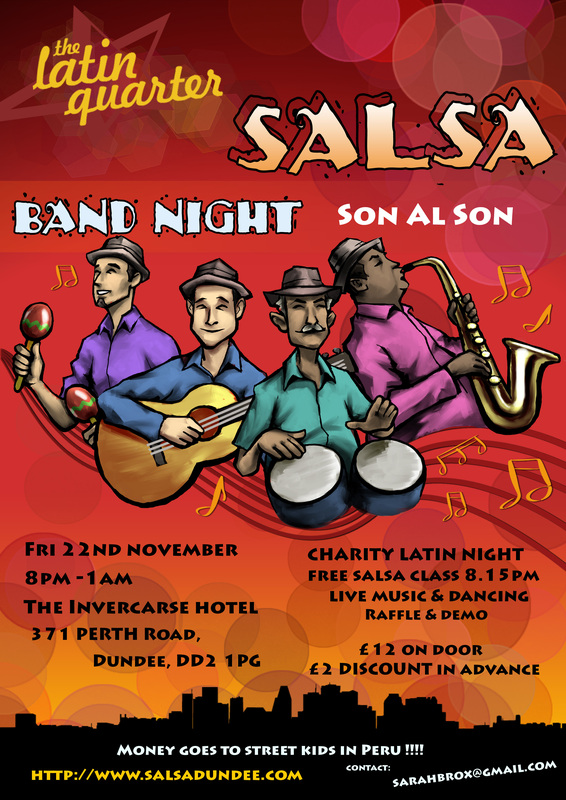 LATIN QUARTER CHARITY BAND NIGHT with the groovy live band SON al SON @ The Invercarse Hotel, 371 Perth Rd, Dundee, DD2 1PG on Fri 22nd Nov. Timings 8pm till 1am, with free Salsa beginners class at 8.15pm. Tickets £12 on door or £2 DISCOUNT in advance from sarah at classes or via sarahbrox@gmail.com also from Grouchos in Dundee ( cash only). Will be a raffle on the night. Tables can be reserved via sarahbrox@gmail.com for 10 to 12 people for prepaid ticket holders. All money raised for the Azul Wasi project in Peru near Cusco, home for former street children. Please pass the word if you can !